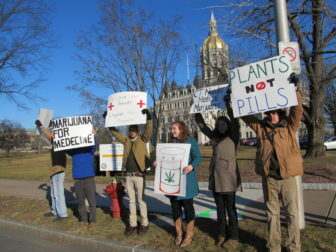 A demonstration outside the State Capitol in support of medical marijuana. By the time Ann Marie Owen turned to marijuana to treat her pain, she was struggling to walk and talk. She also hallucinated. For four years, her doctor prescribed the 61-year-old a wide range of opioids for her transverse myelitis, a debilitating disease that caused pain, muscle weakness and paralysis. The drugs not only failed to ease her symptoms, they hooked her. When her home state of New York legalized marijuana for the treatment of select medical ailments, Owen decided it was time to swap pills for pot. But her doctors refused to help. While 29 states have legalized marijuana to treat pain and other ailments, the growing number of Americans like Owen who use marijuana and the doctors who treat them are caught in the middle of a conflict in federal and state laws — a predicament that is only worsened by thin scientific data. Because the federal government classifies marijuana as a Schedule 1 drug — by definition a substance with no currently accepted medical use and a high potential for abuse — research on marijuana or its active ingredients is highly restricted and even discouraged in some cases. Scientists say that stance prevents them from conducting the high-quality research required for FDA approval, even as some early research indicates marijuana might be a promising alterative to opioids or other medicines. Patients and physicians, meanwhile, lack guidance when making decisions about medical treatment for an array of serious conditions. The problem stems partly from the fact that the federal government’s restrictive marijuana research policies have not been overhauled in more than 40 years, researchers say. Only one federal government contractor grows marijuana for federally funded research. Researchers complain the pot grown by the contractor at the University of Mississippi is inadequate for high-quality studies. The marijuana, which comes in a micronized powder form, is less potent than the pot offered at dispensaries, researchers say. It also differs from other products offered at dispensaries, such as so-called edibles that are eaten like snacks. The difference makes it difficult to compare the real-life effects of the marijuana compounds. Researchers also face time-consuming and costly hurdles in completing the complicated federal application process for using marijuana in long-term clinical trials. Cunningham, who received a five-year, $3.8 million federal grant, will not be administering marijuana directly to participants. Instead, she will follow 250 HIV-positive and HIV-negative adults with chronic pain who use opioids and have been certified to get medical marijuana from a dispensary. Without clear answers, hospitals, doctors and patients are left to their own devices, which can result in poor treatment and needless suffering. Hospitals and other medical facilities have to decide what to do with newly hospitalized patients who normally take medical marijuana at home. Some have a “don’t ask, don’t tell” approach, said Devinsky, who sometimes advises his patients to use it. Others ban its use and substitute opioids or other prescriptions. Young adults, for instance, have had to stop taking cannabidiol compounds for their epilepsy because they’re in federally funded group homes, said Devinsky, the director of NYU Langone’s Comprehensive Epilepsy Center. The Trump administration, however, has resisted policy changes. Last year, the Drug Enforcement Administration had been gearing up to allow facilities other than the University of Mississippi to grow pot for research. But after the DEA received 26 applications from other growers, Attorney General Jeff Sessions halted the initiative. The Department of Veterans Affairs also recently announced it would not fund studies of using marijuana compounds to treat ailments such as pain. While experts say they don’t know exactly how many older Americans rely on marijuana for medicinal purposes, the number of Americans 65 and older who say they are using the drug skyrocketed 250 percent from 2006 to 2013. Some patients turn to friends, patient advocacy groups or online support groups for information. Owen, for one, kept searching for a doctor and eventually found a neurologist willing to certify her to use marijuana and advise her on what to take. Mary Jo, a Minnesotan, was afraid of being identified as a medical marijuana user, even though she now helps friends navigate the process and it’s legal in her home state. Still, doctors and scientists worry about the implications of such experimentation. The national academies’ committee reviewed more than 10,000 scientific abstracts related to the topic. It made 100 conclusions based on its review, including finding evidence that marijuana relieves pain and chemotherapy-induced nausea. But it found “inadequate information” to support or refute effects on Parkinson’s disease. Yet those who find that medical marijuana helps them can become fierce advocates no matter what their doctors say. Caryl Barrett, a 54-year-old who lives in Georgia, said she decided to travel out of state to Colorado to treat her pain from her transverse myelitis and the autoimmune disease neurosarcoidosis. Georgia, meanwhile, permitted limited medicinal use of marijuana but did not set up dispensaries. As a result, patients resort to ordering it online or driving to another state to get it. Melodie Beckham, who had metastatic lung cancer, tried medical marijuana for 13 days in a clinical trial at Connecticut Hospice before deciding to quit. “She was hopeful that it would help her relax and just kind of enjoy those days,” said her daughter, Laura Beckham. The marijuana “didn’t seem effective,” nor did it keep her mother from hitting her pain pump to get extra doses of an opioid, her daughter said. The researchers running the trial at Connecticut Hospice spent two years getting necessary approvals from the Food and Drug Administration, the National Institute on Drug Abuse (NIDA) and the DEA. Started in May, the trial has enrolled only seven of the 66 patients it plans to sign up because many patients were too sick, too close to death or simply couldn’t swallow the pills. So far, the trial has shown “mixed results,” said James Prota, director of pharmacy for the hospice. Researchers point out they are still exploring the basics when it comes to marijuana’s effects on older adults or the terminally ill.
Kaskie, who specializes in public policy and the aging, received grants from the state of Colorado and the Chicago-based Retirement Research Foundation to survey the use of medical marijuana by older Americans. In many quarters, there’s a growing appetite for solid information, he said. Twenty researchers received marijuana from the federal program last year, which was more than any previous year since 2010, according to NIDA statistics. In a recent funding announcement, the National Institutes of Health requested grant applications to study the effects of marijuana and other drugs on older adults and pain. NIH, however, continues to funnel much of its funding into studying the adverse effects of marijuana, researchers said. This story first appeared April 12, 2018, in Kaiser Health News (KHN), a national health policy news service. It is an editorially independent program of the Henry J. Kaiser Family Foundation, which is not affiliated with Kaiser Permanente.